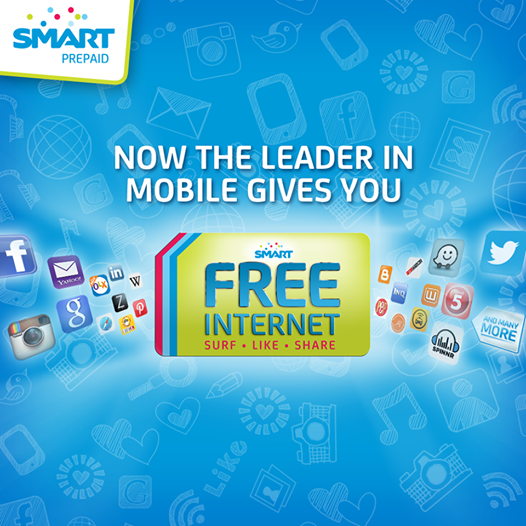 Last Friday, PLDT chair Manny V. Pangilinan himself announced the astounding news that the giant telco will be providing free Internet services to all the prepaid subscribers of Smart, Talk 'N' Text and Sun Cellular. That's news, entertainment, social media, complete mobile communications (ya know, email! ), and online transactions suddenly available to 66 million Filipinos. That is huge. The free Internet isn't unlimited. It's up to 30MB a day. That's not a lot. And yet, for people who have never had Internet on their mobiles before, that's enough. I should know. I used to have limited Internet before and even then I felt so amazed. Like, "Wow, I can check my email anywhere! Wow, I can't tell my boss I was stuck in traffic and didn't see her email!" Heehee. Okay, so what does 30MB get you anyway? You can check and update your social media accounts (Facebook, Twitter, Instagram, etc), read news/entertainment/magazine articles online, manage your emails, stream music, shop online. You can do a lot naman. Just not unlimited use. So maybe the "I didn't see your email," excuse might still work. Heehee. Now, some people think what's the point of offering Internet to the masa. I've seen some comments on social media go, "Do they even have email? Do they even have clothes for #OOTD? Do they have bank accounts for online transactions? Do they even read?!" I think it's an amazing opportunity!!! I think information should be democratized. I believe everyone on the planet should be connected. Relationships are easier. Friendships can be made with anyone, anywhere, everywhere (almost all my friends now I met online!). I think a lot of work (like my work) can be done while at home or anywhere else just not at the office, and that means more time for the family, less expenses, more life (that's a Smart hashtag right there! #LiveMore!). I know that a ton of business can be started and conducted online and people who have limited resources can now have a chance to compete and succeed. I believe people get smarter and make better decisions when education and information are not limited to schools and books made unattainable by high cost or distance. I know people are empowered and take action when they're armed by information. Real change happens when information is fast and free. The Internet makes this possible! Google knows this and has a project called Loon. It's a network of floating balloons that people can connect to. Project Loon wants free Internet for every single person in the world because information is power. When the "masa" is informed, even on 30MB a day, they may just read chismis, but they can also learn how the world works. When we're all connected, it's hard to ignore getting informed, forming opinions, making changes, changing lives. And that's why I think the free Internet service is awesome! And I applaud Smart, Talk 'N' Text and Sun for offering this! I hope the experiment works because when Filipinos get smarter, maybe we'll make real changes. Election season is coming soon, for example. Wouldn't it be nice to educate 66 million voters?